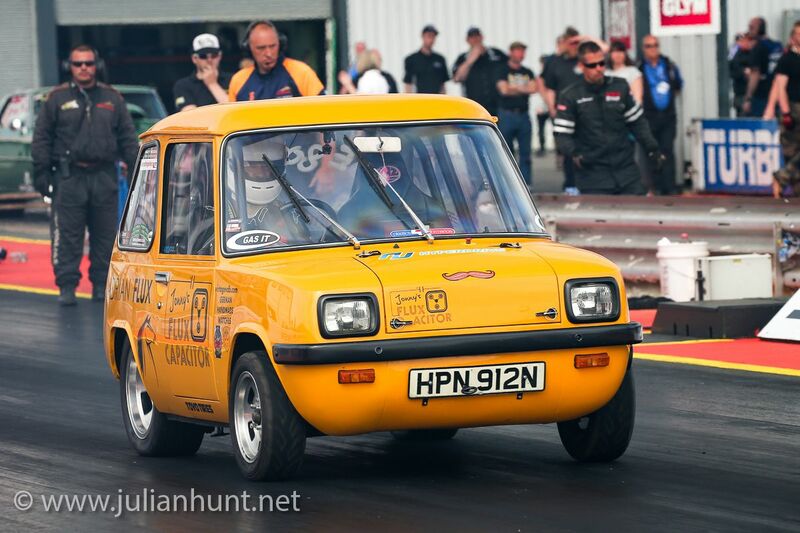 I first ran the Enfield back in March while filming a new forthcoming BBC Worldwide TV series called Motorheads. The weather was cold (sub 10 degrees) at Santa Pod and we were carrying a passenger in the shape of my co-presenter Tom Wookie Ford. 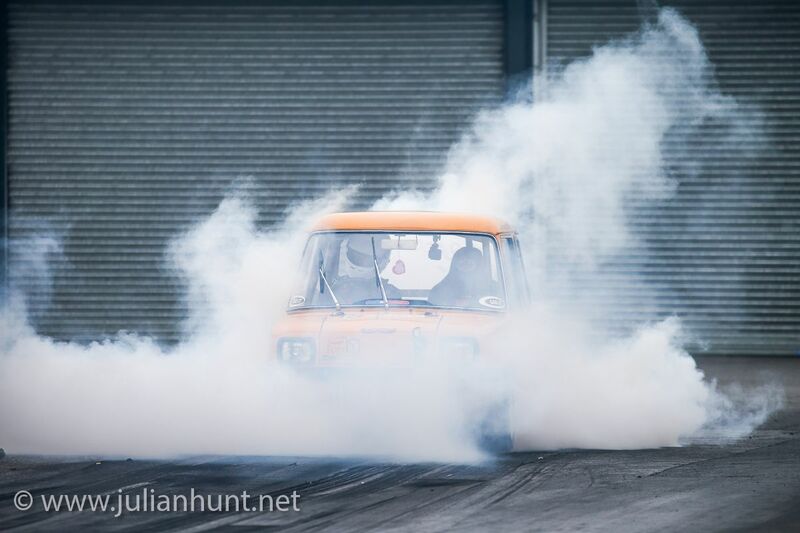 It ran consistent early 11s, – not bad given the weather and track conditions. You may see it on telly somewhere in the autumn. 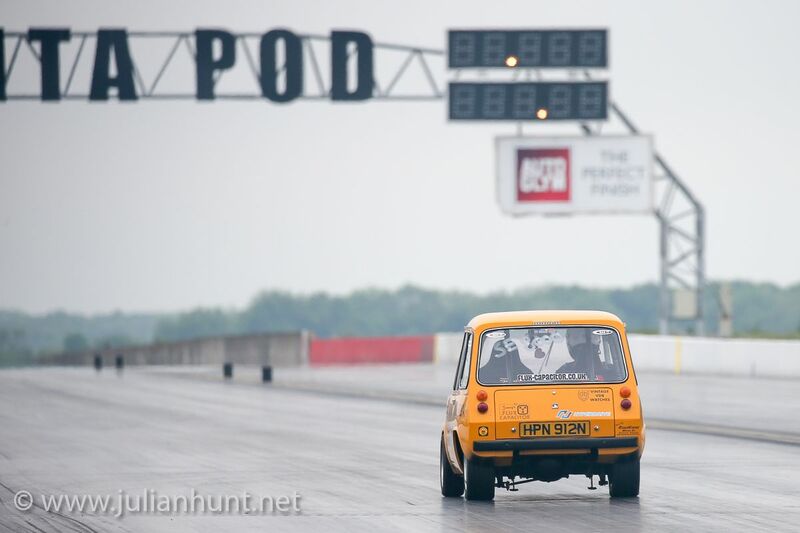 Having the whole track to yourself was pretty special, as well as being a test of stamina for the Flux Capacitor. We did 6 full passes back-to-back with no pause for charge or cooling. Motors got up to 70-degrees, so still within their tolerances. For the filming purposes it was decided to upgrade the passenger seat and mounting to match the race spec driver’s side, so I can now offer swift lifts. New 6-point Schroth harnesses are now fitted too, but you can’t see those in this photo. Sorry. 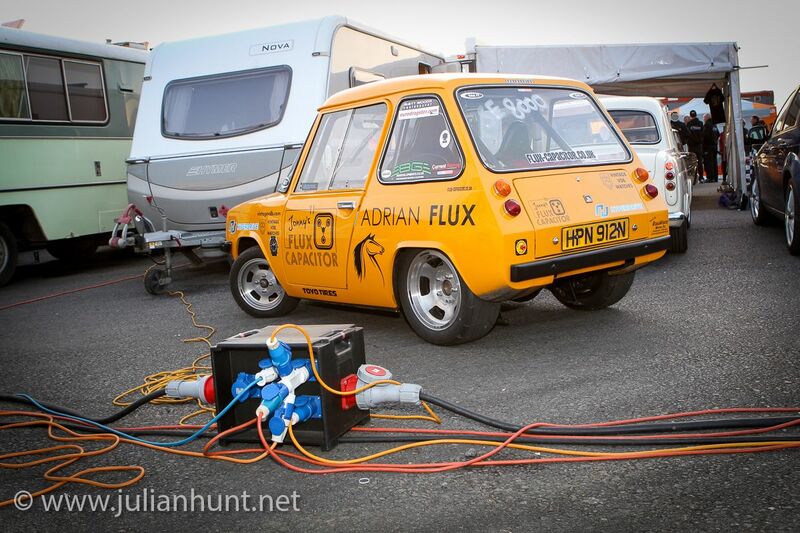 At the end of May the Flux Capacitor was wheeled out for its first competitive drag race of the year, at the Santa Pod FIA Main Event. Straight off the trailer we ran the usual checks and fed in 1850 amps and the usual 302 volts. The result? A 10.79 @ 119mph personal best. It felt awesome. Especially because this was my first trial of the new 205/50/14 Mickey Thompson ET Street Radials. My trusty 205/55/14 Nitto Extreme Drag radials had done us proud, but they were bald and sadly discontinued in Enfield-friendly sizing. Being slightly lower profile meant the Mickeys were smaller diameter, which is no bad thing with the incredibly high 2.49:1 diff gearing. They gripped hard and the little Enfield felt as stable as ever. Sadly, due to my crew man Nick suffering a back problem, we had to leave the Santa Pod Main Event earlier than expected. 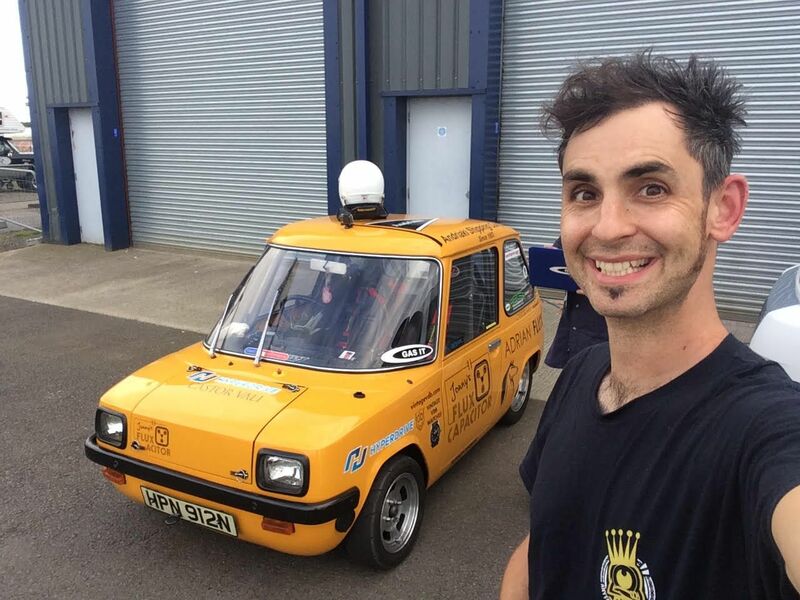 However, for our final run Nick and Olly Young from Current Racing mapped it maximum 2000 amps the Enfield’s Zilla 2K controller can handle. 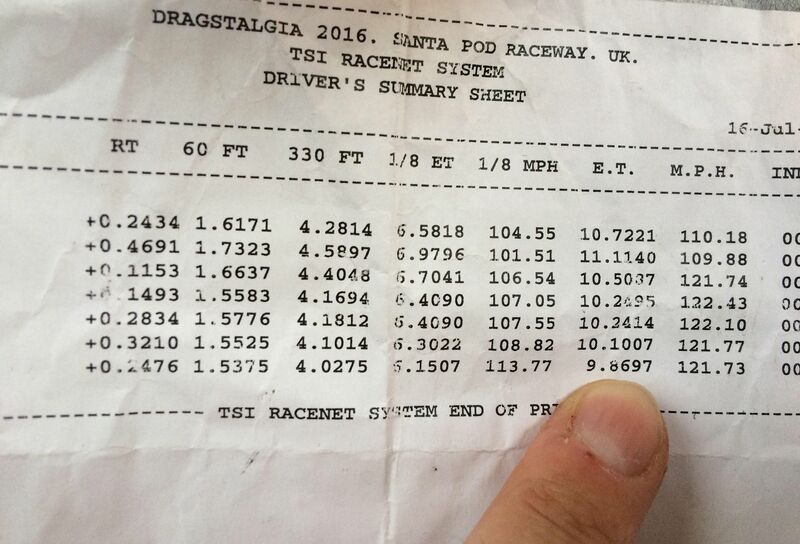 We went home with a fairly respectable PB of 10.66 sec quarter mile and fastest top speed of 122mph. Did we win a trophy? No. Did we get prize money? No. We do this for personal goals and a faintly printed pathetic slip of paper that proclaims the performance of your car. I also have some vid footage which we will upload shortly. AS FAST AS AN AVENTADOR, FASTER THAN A McLAREN. To put this into production car perspective, I delved into American magazine Motor Trend. On the ¼ mile a Lamborghini Aventador does a 10.6 @ 133mph. Ferrari 458? 11.1 @ 125mph. Porsche 911 Turbo S? 10.9 @ 123mph. 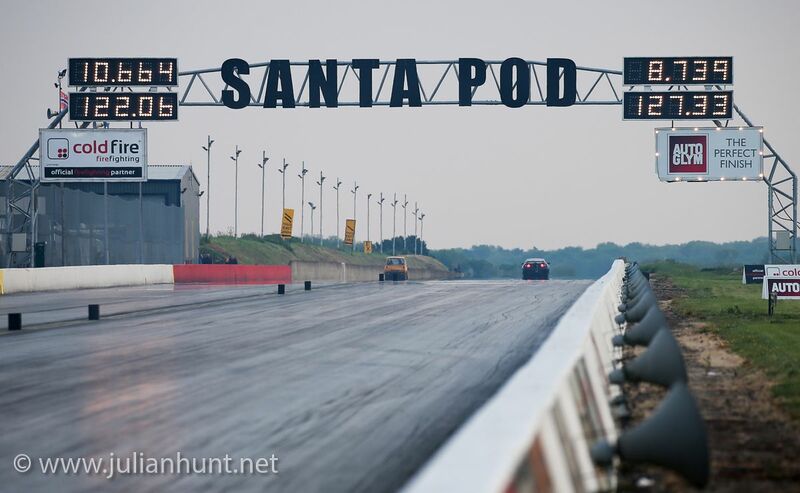 McLaren’s 650S smashes the drag strip in 10.7 with a terminal mph of 134. Yeah, the Enfield is that quick now. And yet bizarrely, it still is so smooth, easy and stable to drive. It doesn’t have the traction/launch controls that these supercars have, but it is now capable of beating all of them over a standing quarter. You have to laugh. Many thanks to Julian Hunt for permission to use his photography. may I ask what kind of electric storage device you use: batteries, super-/ultra-caps or what else? I am planning to convert my Danish “CityEl” one-seater from lead-acid to ultracaps instead of the usual lithium-ion batteries for that purpose. Do you have any recommendations for it?